The five-yearly Moda Manhattan Show – to take place between May 4th and May 6th – has been growing tremendously each year since its 2002 launch. Today, it attracts over 14,000 visitors, offering them the latest exhibit design and amenities. Suited to its environment, it takes place in the fashion capital of the world – The Javits Center, New York City. Opening times: Sunday and Monday (4th and 5th May) 9am to 6pm and Tuesday (6th May) 9am to 4pm. New York is an absolutely fabulous place to live. From the city’s iconic skyline, Manhattan’s grid, the fact that everything stays open so late (bars til 4 am!) and the extremely high life expectancy (such as Susannah Mushatt Jones, 113 year old NYC resident who is currently the world’s third oldest person), this is a great place for anyone to live. But it doesn’t come without its problems. A recent report found that the city’s 311 complaint hotline receives an average of 300,000 annual calls about the noise. Perhaps that’s why it is so often referred to as “the city that never sleeps.” Still, that’s not fun when you’re trying to sleep there. So, where can you go to get away from it all? 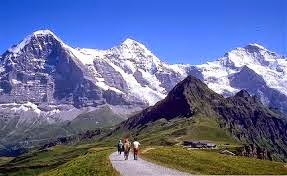 Switzerland is pretty antithetical to everything that is New York, so this article examines three areas there and tries to get a sense of the experiences people have. First, Saas-Fee – is a stunning area, perfect for a relaxing, “get-away-from-it-all” break. For a couple who just wants to leave all the craziness behind for a bit, it truly is perfect. In fact, that’s exactly what one couple did. Marnin Michaels and Melissa Kaplan recently purchased a ski chalet in the neighborhood. Michaels describes it as “a second-tier ski town…nestled under a ring of glacier-topped mountains and enjoys sun most of the winter.” What could be a better way of escaping it all than that? Then there is Atelier, described by one travel reviewer as “paradise in a private winter wonderland.” Now, New York may be many things, but privacy and silence are not words often associated with it. The Atelier on the other hand, was dropped into the middle of a secluded private fairy tale forest and houses a fireplace, sitting rooms, gallery and more. Ambience is its middle name. Nendaz is romantic, relaxing, picturesque and in fact, simply breathtaking. This is exactly what many people should expect to find at the Haute-Nendaz Chalet. After a few days of taking in the Rhone Valley view and biking in the alps, New Yorkers might actually be excited to get back to the hubbub of New York City…but always remember the relaxation possibilities a mere flight away! If you’re looking for a place to see and be seen in Midtown, this might just be it. 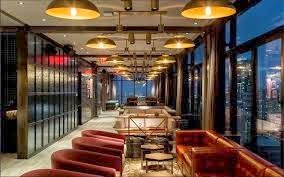 Located on above the 30th floor of 530 Seventh Avenue in Midtown Manhattan, Skylark Lounge includes a bar and soon-to-open terrace. It required two years of construction and an $11 million investment. The bar is open Monday through Friday, with weekends reserved for weddings, private dinners and other events. In May, when the rooftop bar and terrace are open for the 141 people they will hold, people will have a view of the Empire State Building, the Chrysler Building and the New Year’s Evve ball drop. The menu, created by Awerbuch and Kirsch, are sliders, lobster tacos and French frieds and more. The general manager, Andres Rizo, keeps everything running smoothly from 4:30 pm until midnight. Skylark Lounge is definitely the new place to be.